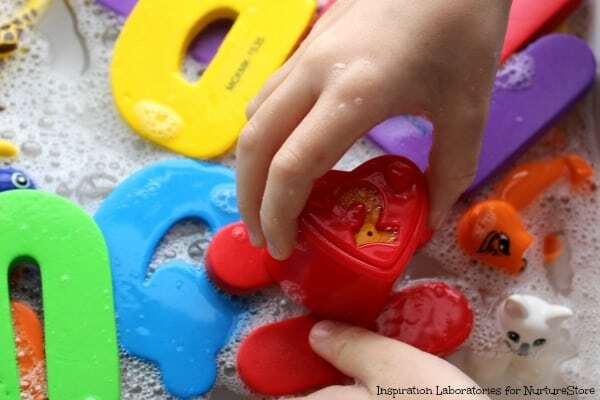 Trisha from Inspiration Laboratories is with us today in our ABCs and 123 letter and number activities series, with a super sensory, super fun way to learn alphabet letter sounds. 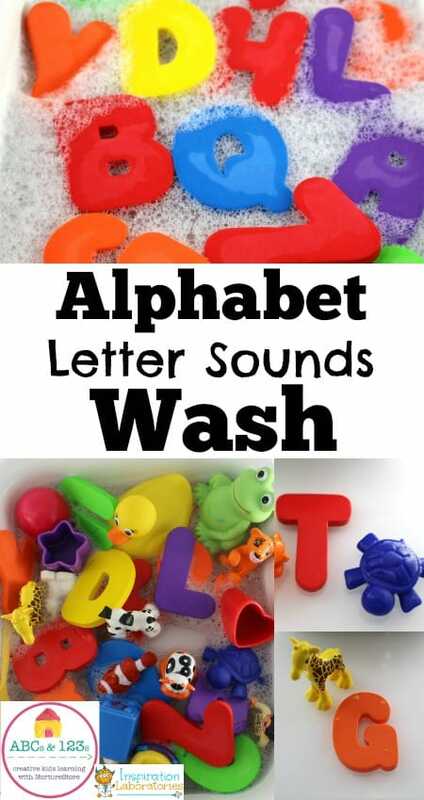 An Alphabet Letter Sounds Wash is such a fun way to practice letter recognition and beginning letter sounds. I set this activity up for my toddler but my 6 year old wanted to play, too. It turned into a great activity for the both of them to play together. Fill the container with soapy water. Choose a handful of toys that are safe to be submerged in water. 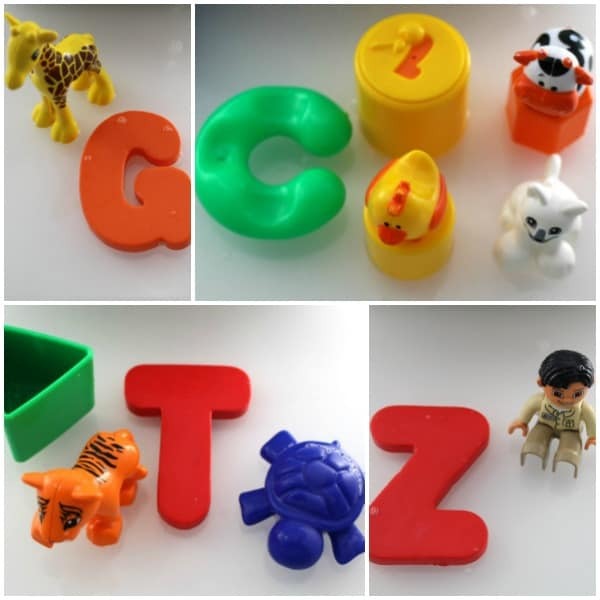 Select foam letters that match the beginning letters of the toys. Add in a few extra letters. 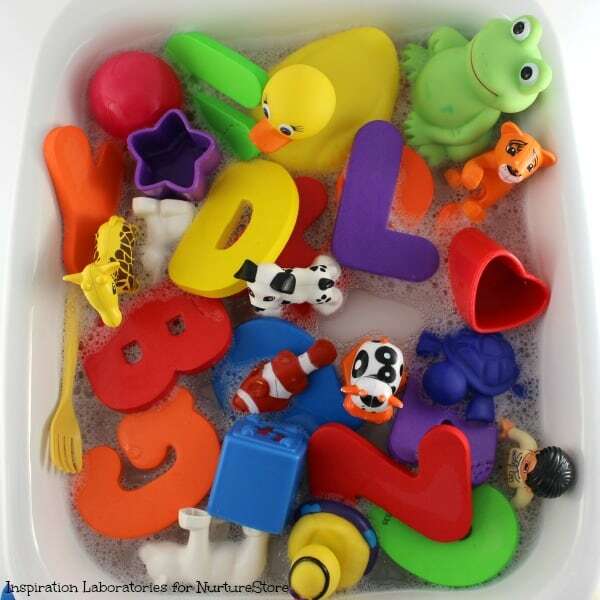 Encourage your child to select a letter from the bin to wash. Ask her what letter it is or what sound the letter makes. If you are just introducing letters, you can say the name and sound of the letter first. You can also ask your child to select a specific letter. Say: Can you find the letter G? What sound does G make? 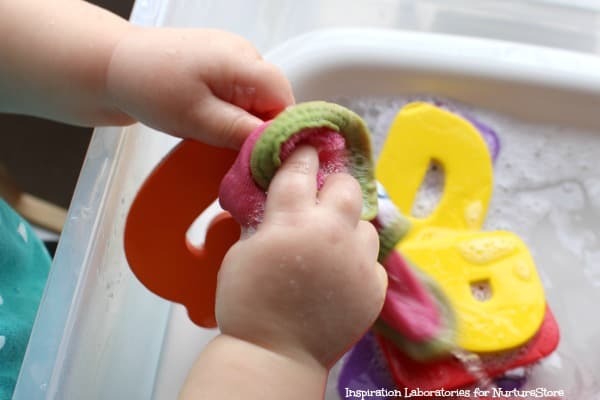 To work on beginning letter sounds, ask your child to choose a toy that starts with the letter he has. Can you find something that starts with the letter H? Or you can select a toy first and then find the matching letter. What letter does heart start with? You can work on just one word at a time. Giraffe starts with the letter G. What sound does G make in the word giraffe? What letter does zookeeper start with? What sound does Z make? Or you can ask your child to find all of the toys that start with one letter. Can you find all of the toys that start with T? What sounds does T make? Can you find everything that starts with the letter C? Talk about the different sounds that the letter C makes in different words. The most important part of this play time is that you and your child are talking about the letters, words, and/or the letter sounds. How much of each is up to you and where your child is. Letter Sounds Race – Practice letter recognition and letter sounds with a fun game that gets kids moving. Super Hero Letter Rescue – Help the super heroes rescue the letters in this game that’s perfect for toddlers. Beginning Letter Sounds Flower Matching Game – Work on beginning letter sounds with this fun matching game that uses paper flowers and toys. Trisha is a science educator and stay at home mom to three. She believes in learning through play. Subscribe to the Inspiration Laboratories weekly newsletter. Each issue has exclusive hands-on science explorations for children, a recap of our latest activities, and special resources selected just for you!